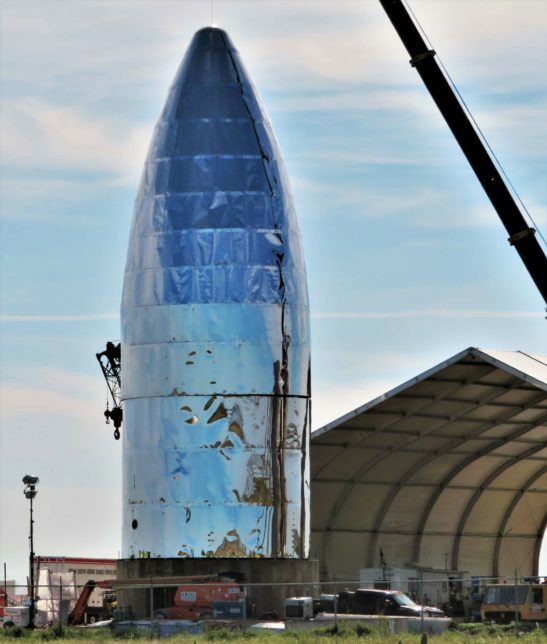 Critical to the arrival and installation of its Raptor engines and the craft’s first hop tests, this work continues despite the premature demise of Starhopper’s apparently fragile nose cone (fairing), toppled on January 22nd when fairly mild winds of around 50 mph (80 km/h) encountered the shoddy rigging meant to keep the huge but lightweight hardware on its concrete stand. 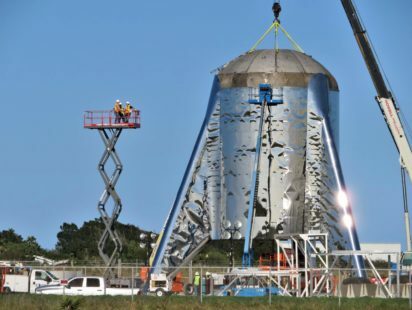 Meanwhile, in Boca Chica: A crane is making offerings to the Starship Hopper propulsion element to distract it from the ongoing surgery taking place on its fairing/nosecone inside the adjacent SpaceX medical tent.#Dramatized ? 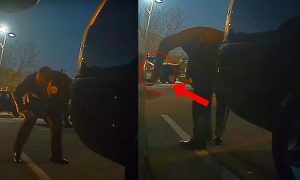 As photos and the media fervor that ensued generally illustrate, the nose section certainly was not effectively held to its concrete stand, causing the insufficient rigging to break and the large sheet metal structure to unceremoniously collapse and fold in half under its own weight. While 50 mph (90 km/h) gusts are not insignificant, they are also fairly common, especially when located on the unprotected edge of the South Texas Coast in the middle of the winter. 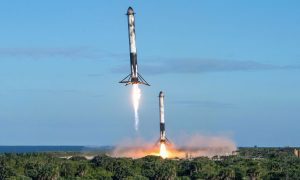 Put in a slightly more direct fashion, building a complex structure outside without ensuring that it will be able to withstand the region’s average inclement weather would be an embarrassing oversight for even the most basic construction project, no less SpaceX’s first Starship prototype. 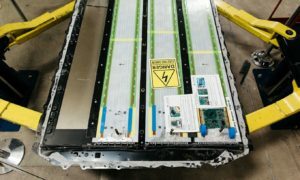 It’s also possible that local construction contractors are being leaned on to complete an aerospace-ish project they would likely have little practical experience with, in which case run-of-the-mill workplace miscommunication or a failure to double-check work (rigging) could have easily led to the fairing’s demise. 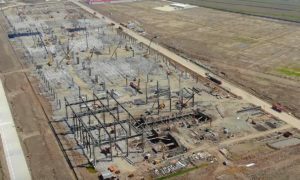 Regardless, what is done is done and whatever lessons were learned the hard way will hopefully prevent a repeat and encourage better workmanship throughout the project. 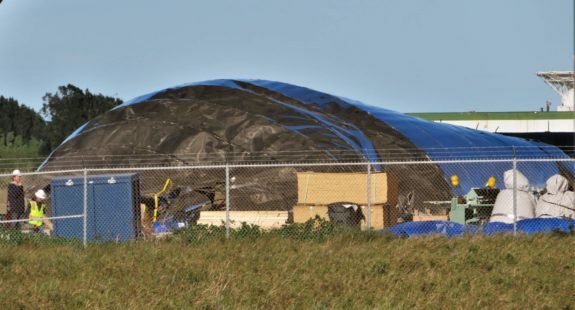 With the crumpled fairing section now beginning repairs under SpaceX’s lone on-site tent, SpaceX workers and contractors got back to the (available) tasks at hand and took another step towards Starhopper’s completion, installing the craft’s topmost propellant tank dome and effectively ‘capping’ the most important segment of the prototype. 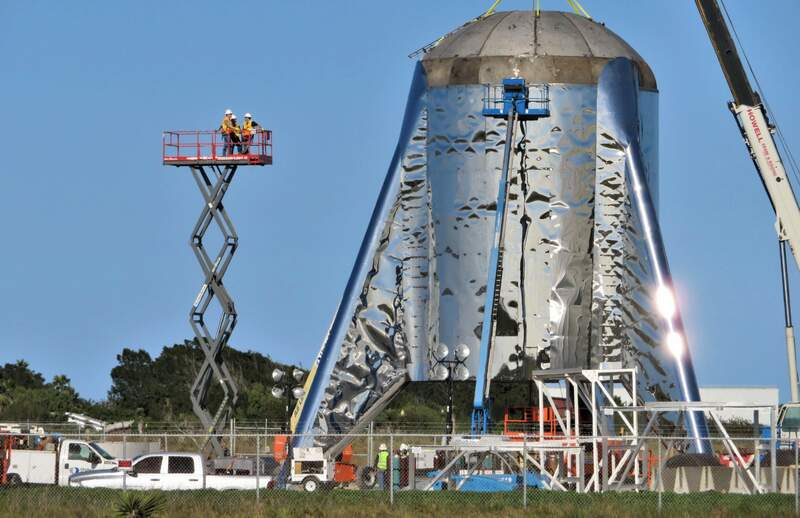 After capping Starhopper’s tank and engine section, additional tank segments continued to be craned inside the aft section through the top dome’s large header gap, presumably allowing workers to finish up work while the craft is quite literally built around them, an undeniable method of saving time. 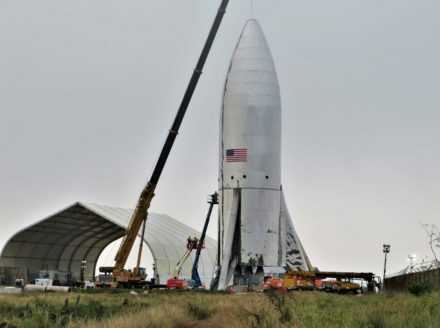 Up next, the most obvious milestone for Starhopper will be the static firing of its Raptor engines at SpaceX’s McGregor, Texas test facilities, followed soon after by the delivery of the first flight-worthy engines to Boca Chica for installation on the Starship prototype. 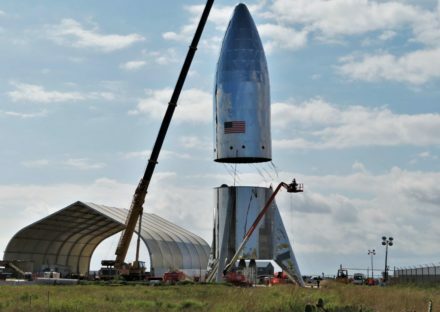 Given Musk’s January 5th estimate that SpaceX was 4 to 8 weeks away from the first hop test and the Jan. 23rd addition of “a few weeks” to repair the craft’s nose section, it’s probably safe to expect Starhopper’s first hop tests to begin no earlier than (NET) mid-March. 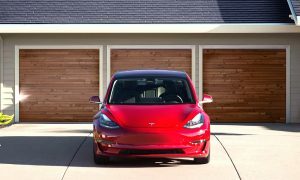 This should also give construction workers a welcome influx of time to complete the Falcon 9-class hopper’s first rough launch pad.